It is now time for Link A Finish Friday. Today I would like to start with a big thank you to Fat Quarter Shop who has offered to Sponsor our Link A Finish Friday with Prizes. This month's winner (Febuary) will win a $15 gift certificate to spend on Fat Quarter Shop. I would like to introduce any that does not already know about the wonderful blog "Such a Sew and Sew" hosted by Elizabeth. This is one of the blogs that has influenced me the most since I have started quilting and one of the first that I followed. You could say I am a little biased because I have won things from her. I will explain my newest thing later in this post. 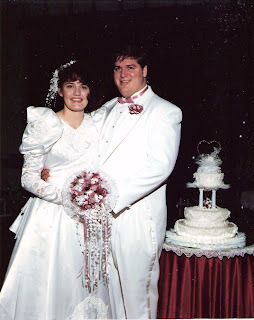 A year ago with in the first few weeks of the year she was celebrating her Birthday and Blog anniversary, She inspired one of the funny posts I have done in the past where I offered as a giveaway my 17 year old son (well 16 at the time) if you have not read it go do so, its funny. Long story short I won my first prize from her in February of last year, a Jelly roll which you can read on this post. I am one that loves to talk (if you can't tell from my blog) and if you have ever commented on my blog (which I encourage) you will almost always get a fun response back. I have had many a fun conversation with Elizabeth. I think what I enjoy most about her and her blog is that she is friendly and helpful. Through the early days of my blog when I had no clue what I was doing (Sometimes I still think I have no clue) she would always help and encourage me and later on I though reading her blog was inspired to try many new and exciting quilting techniques. For example my great desire to learn paper piecing is so that I can do some of the amazing things she has done. Well she does not know that I am doing this today, but I am sure she will read it as she has read and commented on almost every post I have ever written. She is a True hero to me. 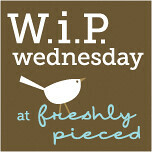 Take some time today and go visit her blog at http://emsewandsew.blogspot.com/. You will love her blog, and while you are there tell her hi from me. So as mentioned above there was incentive to me praising Elizabeth and its not just because she is a wonderful person. Its that I won a wonderful prize from this months B-Day and Blog Anniversary. This is a fat quarter from each of the 20 prints in the Indie from Pat Bravo (Art Gallery Fabrics). I am sitting here right now looking at all the pretty colors and trying to come up with a project or 2 to use them in. (suggestions welcome). This is not what makes me realize how special and neat Elizabeth is, almost a year I talked about a quilt that my wife Tanya wanted to make. 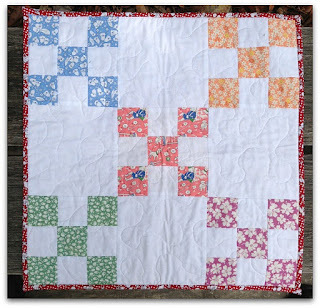 It is a "Bug Jar" quilt if you have ever seen one I talked about it back in this post. One of the things we realized is it is harder then one thinks to find the proper type of bugs to go in our bug jars. In our conversations she mentioned that her and her mother were also working on a bug jar quilt. Well along with what I won above, I received a huge stack of "Bugs" I am so excited Tanya and I can now finally do the bug quilts that we wanted to make. So again check out Such A Sew and Sew and see why she deserves a post all about her. Oh and for those interested in giveaways she has a wonderful finish giveaway every month (I won one last year) Go link up your finishes and win something too. A few weeks ago I started working on a "strings quilt" and went though a small pile of strings that my wife put in a small basket. I had 2 large plastic containers of "Scraps" in my stash and since I want to do a large project with 2 1/2 inch squares more or less a rainbow. Any way I have been going though the bins and I have made a small dent in the pile. I now have the gallon size bag of strips for my strip quilt above and I have tons and tons of 2 1/2 inch squares. The ones on the left below are sorted by colors and the ones on the right still need sorting. Note this pile does not include the leftovers from my Gray and Orange quilt (or the Orange + quilt). Though there are a number of new grays on the bottom right of the not sorted stuff to add to that. The amazing thing is I still have too much to go through, this is what is still left in my "Scraps" basket below. I think it will take me another month of cutting to go though it all. Maybe I will have to make some string blocks again this week. But then again, Tanya plopped a new quilt she basted on my desk and told me its ready for the "Quilting Fairy" to quilt it. The other night I told my wife that I was finally going to use my twisted ruler. I bought the ruler a year ago, with the desire to make a wall hanging or quilt with this pattern as I find it enjoyable. Being scared of the weird shape, it has set in a box all that time without being used. Well I am finally turning over a new leaf and doing things that scare me. On other notes of things that can sound scary, last Thursday was our January meeting for the SLMQG and they elected their new board of officers for the next year. You say that does not sound scary. My thoughts exactly when I walked into the meeting. When I walked out I was thinking other things. Here is the Board as it was Elected. Yes you read it right I am on the board. I am excited in the sense that I guess that means I have been accepted as a male quilter. I am also nervous because now I need to step up and do a job that makes me nervous. Not that I don't have the skills. I am a programmer first and know my way around some web content. I am nervous that I now have some responsibility and can't let them down. So I like to have a question in almost all posts I write. My question for today is have you ever served on a Quilt Guild Board and if so what position and tell me about it so I know what to expect. If not a quilt board have you ever served on any board for a group or organization and if so same question. Any way I need some encouragement and advice. I guess I need to step up the modern game a bit more to fit in better. Oh and if you don't think I am in enough trouble with just the board stuff check out this video of Julia walking. Julia has improved her talents. 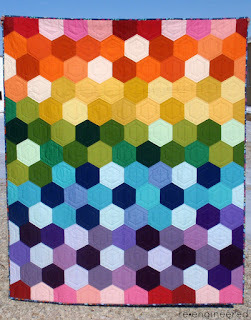 The simple rainbow crib size quilt out of mostly non floral prints from Ticklish line by Me & My sisters is done. This was a very simple quilt, basically 2 rows of 10 4.5 inch blocks of each color. I pieced the top, basted it, and made the binding and my wonderful husband quilted it and bound it. I really like the way it turned out. It is one of my favorites. It has a light pink minky back. Unlike many quilters, we use a cotton batting plus the minky. It makes for a heavier quilt, but also seems to make it easier to baste and to keep the minky from stretching/shifting. The binding was done using a rainbow stripe leftover from all of our Twirl quilts. 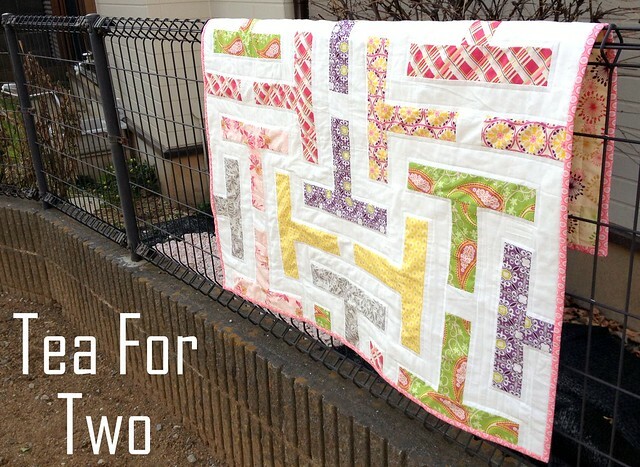 This quilt has been added to our Etsy store, as Julia has way too many quilts, at least until she is a little older. You are most likely thinking I am early for next Christmas. That is not the case, I am behind on last Christmas. Some of these pillowcases are gifts for Tanya's Step brother and sisters kids. Though Tanya did manage to get a few also listed on our Etsy Store The Perry below is one, as well as the Dr Suess. You can buy this one here. So what the heck is this bag of stuff? I have been going though all our scraps looking for more strips for my strip quilt and I can't help but turn any scraps that are bigger then 2 1/2 inches into blocks. You will see many quilts this year with 2 1/2 inch blocks. I have hundreds and hundreds of them now cut out. What to do with them? I don't know, time will tell though. Posted by Tanya. Yet another rag quilt. I had this cut out waiting to be assembled before Christmas, but had a zillon other projects to finish. This one in gray and pink and hearts. These are some of my favorite colors and I love hearts. Do you notice a trend? They happened to be our wedding colors way back when, almost 20 years ago. Richard likes oranges, I like pinks and grays. Our 20th wedding anniversary is coming up in less than three months and we are trying to figure out something to do that won't completely break the bank, and doesn't involve too much travel as we have four kiddos to worry about. Most likely, our usual dinner and movie will end up being it. 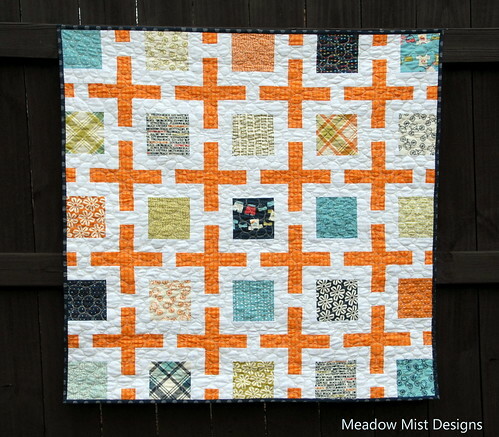 For this weeks Work in Progress Wednesday I though I would show you a few pictures from my Gray/Orange (well orange, yellow, red) Plus quilt. A few months ago at on of my SLMQG meetings during show and tell commented that the quilt I was showing was the most "Modern thing" she had seem me do. I could have taken that as a insult. Iinstead I took it as a challenge that I need to try some more modern things. Well any way above was part of the next modern thing that I will show off. Above is the bottom and below is the top (Yes I could have put them in the right order, but what fun would that be). Tanya has been working the past few weeks on getting our Etsy Store more organized and I have been working on not feeling rushed. Today's post is by Tanya. 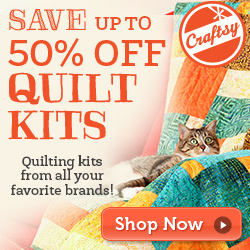 I have been trying to figure out how to sell quilts on Etsy. We have sold a few rag quilts, but no pieced quilts yet. I decided to make two baby quilts, one pieced and one rag out of the same fabric. I chose the owls and jacks from Ten Little Things. Both quilts are relatively simple and have the same green flannel for the back. Owls seem to be a popular item for babies right now. Here are pictures of the rag quilt that is finished. The pieced quilt top is finished and basted and waiting to be quilted. I was going to show a comparison shot, but I guess I didn't take a picture and I am too lazy to go take one. I guess another post about that one. This one will be added to our Etsy store in the next few days. How do you take your pictures for your blog or online store? Do you have a photo booth, a special stand for hanging quilts, have someone hold them up or what? Do you use special lights? I would appreciate suggestions, especially ones that won't cost a fortune. We have a pretty good camera, a tripod somewhere, editing software, but haven't had much luck with inside pictures other than closeups or folded quilts. There is over a foot of snow on the ground at our house and the high tomorrow is 14 degrees Fahrenheit. Outside pictures are out until it warms to at least freezing. I already work out in the cold, so I don't necessary want to go out in it anymore than I have to. Well I guess I don't need strings, as much as string blocks. I went to try and organize some of my sewing room today (since I was making the kids clean and all I figured it just seemed fair, I did also. It started with the great intent to clean up some of the mess. I saw all the strings laying around, some of which I bought in a bag of scraps for 3 bucks and some are scraps from projects I have done. I made 4 initially. Then I found a few more strings that looked good and made another 11. So I showed Tanya my nice pile of string blocks (these are 6 1/2 squares) and she looks over and says they look too red. Hum, I like red? Maybe I should have used more variety. I ask her what I should have done and then she just looks over again and tells me she really does not like random. So what do I do now, she hates them? Oh I know. Yep you guessed it, I just made more blocks. My feelings is you can't make every one happy all of the time. Over the years I have learned Tanya does not like all my wise choices (or even my unwise ones). I will keep using up all those silly scraps up that I have until I run out of them. Overall the layout plan I am going for will be something like this. This is something I whipped up in EQ7. Its 9 x 12 blocks (total of 108 blocks). Seeing as I have around 30 blocks it won't be any time soon. I will from time to time add blocks to my collection. The blocks today that I made ended up in my homeless block box (Yes I have a box with a lot of various blocks in it now). It might take me 6 months to finish this one, but its at least started today and a little of my cleaning is done. Oh and for any one that was wondering, while I was distracted the kids did not clean and the house is still a mess, oh well there is always tomorrow. I will end with this cute picture of Julia. Tanya was trying to get a cute picture of Julia and out of all of her toys it was her shoe she chose to play with.